Are you looking for your dream dive vacation? This is the eighth in a series of reviews of the best dive resort locations around the world. In this post, the focus will be Panglao Island in Bohol, Philippines. Background – Panglao Island is located on the southern tip of Bohol Province in the Philippines. Resort scuba diving has been steadily developing there for the last 30 years. Today there are dozens of hotels of all levels around the island, but the beautiful shoreline on the eastern side around Alona Beach is the most advanced resort area. Panglao is in a centralized location for going to other outstanding dive destinations including Cabilao and Balicasag Islands. In addition, excursions can be easily arranged to the Chocolate Hills and other land based natural areas with attractions like the tarsier. Undersea World – There is great biodiversity with outstanding macro life for the photographer or marine biologist, and a lot of reef fish, pelagics and large animal life. Highlights include big schools of barracuda and jacks, white and blacktip reef sharks, hammerheads, in season, the occasional whale shark, turtles, whales, dolphins, turtles, ghost pipefish, nudibranchs, pygmy seahorses and many others. See the site summaries below for more. A lot of the dives are on walls with lots of hard and soft corals, giant fans, black coral, various sponges, tunicates, feather stars and a huge variety of invertebrates. Seasons and Conditions – Diving is good year round. It is always warm with a range of 77-95°F (25-35°C) and the water temp between 77-86°F (25-30°C). Most people never need any thicker than a 3 mm wetsuit. The rainiest time is from July to September, but it doesn’t often interrupt diving. Visibility is usually from 15-30 meters (50-100 feet). When it rains, visibility decreases some. The best time for hammerheads is December to April. Liveaboard cruises only touch on the Panglao Island area. 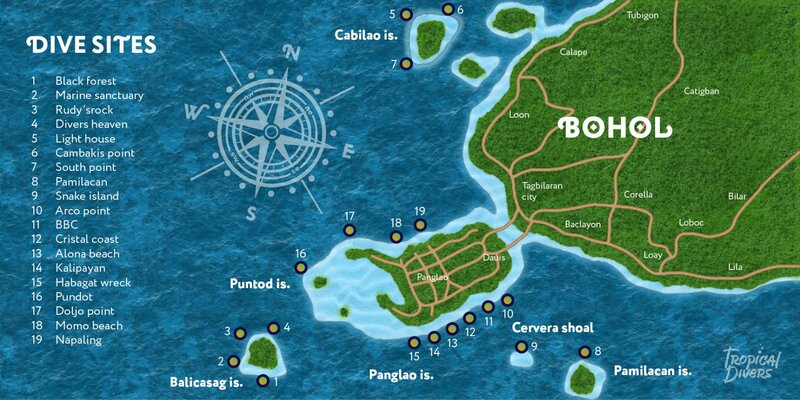 There are very limited opportunities annually to dive on Cabilao and Balicasag on liveaboards with none of them going to the main dive sites east of Panglao Island. These are some of the most famous and popular dive sites. Every dive shop has a number of others they can suggest. In addition to these sites around Panglao, Cabilao and Balicasag Islands, many shops will do trips further away up to Anda, in eastern Bohol and to Sumilon Island, Little Apo Island, Oslob or Siquijor to the west and southwest. Panglao Island has many hotels and resorts from the lowest price backpacker hostel to luxurious full service resorts. From December to April, particularly around Christmas, Chinese New Year and Easter, it can get very busy and the prices also get jacked up a bit. Between May and November it is more relaxed and at times pretty slow. At such times, discounts can be arranged. Generally, though, the pricing is very reasonable, especially for diving and diver training. This looks amazing!!! I have never scuba dived before, I guess it kind of freaks me out. I don’t even use a mouth piece when snorkelling. The island dive sites sounds like they have some sites to see, I love seahorses so Kalipayan Wreck might be my pick!! I would also like to check out BBC (Bohol Beach Club), there seems to be a lot of sea life happening there which I would like to see!! Thank you for the share!! P.S. The turtle is awesome!! I am glad you enjoyed the reading. Thanks for your kind comments. It seems you might be ready for “discover scuba diving.” That is a very gentle experience where an instructor teaches a little diving theory, gets you used to the equipment patiently in the swimming pool and then very closely supervises you on a shallow dive in the ocean on one of the beautiful reefs nearby the hotel. It is really eye opening and wonderful. How does that sound? All the dive shops and resorts can organize this for you. If you have any questions or comments, I’d love to respond. A well detailed location/tourist site review, quite revealing and interesting.There are a lot of sites for diving here and lots of breathtaking views to have for a lifetime. Would appreciate if you added a price list range (might not be accurate figures) for the various sites so we can have an idea.The Philippines just got more enticing with this article. If you would like further advice or information, I’d be glad to help. That is just magnificent. Magnificent! And with so many options, it’s hard to decide where to go. How can you choose? 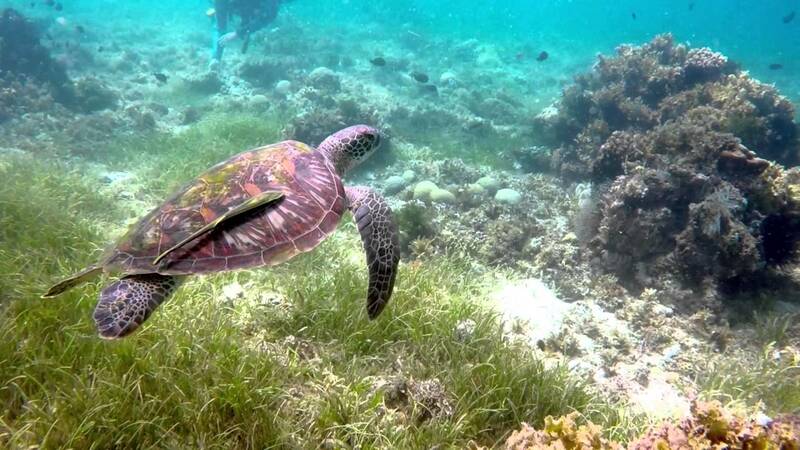 It amazes me how some underwater areas look like land – like the photo with the turtle … with grass growing on the sea floor! Diving is truly a sublime experience when one is able to do it, whenever they can. Thanks a lot for your kind comments. It is very beautiful there with great underwater seascapes, wildlife and coral formations. You indicate there are so many options. Did you go to the Panglao Island Accommodation link toward the bottom of the post? I think maybe you did. There are a lot of resorts available. What kind would you like, something on a budget and more casual or more high service and luxurious or something in between? Let me know and I can suggest something that might suit you. Please let me know. If you have any other questions, I’d love to hear them. What a beautiful and amazing post! ! Diving is not for me but I like to see people doing it and the pictures and videos that are taken under the sea. The videos you posted are wonderful. I would like to go there… I am afraid of going under the sea. Thank you so much for this wonderful post, I loved it. I am glad you enjoyed my post. Thanks for the kind comments. It is a very beautiful place to go, even if you aren’t a diver. The beach and resorts are very inviting. Why don’t you go to the Panglao Island Accommodation link toward the bottom of the site to check out the wonderful options. Snorkeling is good there or you could consider discover scuba diving where you learn a little theory and practice skills in a pool, and then do a very shallow dive in the ocean. This is designed for people who are not avid swimmers and takes into account any fears you might have. All of the dive shops have got very patient and capable instructors who would love to do it with you. As soon I read diving is year round I immediately set out to get my passport. My friend and I absolutely love traveling and finding the best places to have safe under water fun this was really helpful! I am really glad you mentioned diver insurance too that is too great I already feel safer. Now I have to decide which hotel to go to. There are a number of hotels around Panglao Island from budget backpacker types of places up to full service luxury resorts. If you have not already gone there, please click on the link at the bottom of my post labeled “Panglao Island Accommodation.” If you want any advice, I have personal experience with several of them. If you have any questions or concerns, please let me know. I invite you to browse some of the other great diving locations I review. Hi! Thank you Joe! I have been following your series on the best dive resort locations around the world! It has been so cool to have found your site. I have always been interested in visiting the Philippines. And I have heard Panglao Island is very beautiful! I have also been interested in visiting Rudy’s Rock on the Balicasag Island. You have also mentioned it here. Thanks for your support. I’m glad you have checked in on some of my posts. There are a lot of great spots to go for diving around the world. I hope you get a chance to check it out. If you have any other questions or comments, please get in touch. I wish all travel websites were as detailed as this page is. Thank you, thank you, thank you. Only last night, did the Philippines make my list of possible places for a vacation next year. Your article made the Philippines sound even more appealing. Plus, you answered a bunch of the questions I had about the best time of year to go. I have never tried underwater photography YET. After reading about these different dive spots, I think I must add it to my list of to do’s. Granted, I have not gone scuba diving yet. I suppose I should take my classes and get my scuba certification soon. I saw on your about me page that you originally lived in the US. Do you recommend the PADI or NAUI certification? I really appreciate your enthusiasm and kind comments. I am a PADI instructor myself and can recommend their courses highly. NAUI also has a great reputation, but you will will find more PADI instructors and shops available. You can find a class close to your home most likely. I would suggest that you consider to do it at the vacation destination, in this case, Panglao. The shops are set up with fine instructors and high grade equipment, boats and facilities and doing your training on a first rate coral reef makes the course more exciting and meaningful. The basic open water diver class takes about 4 days and includes some study, 5 shallow water classes to learn the skills and 4 open water dives to practice the skills and have a supervised introduction to the undersea world. In addition, for photography I suggest going to my post in the underwater photography category for reviews on a range of cameras and housings (required for the more sophisticated cameras). If you have any questions, please let me know. I hope to hear that you have made a plan to become a diver. Good luck.